Ski Dubai is the first indoor ski resort in the Middle East and offers an amazing snow setting to enjoy skiing, snowboarding and tobogganing, or just playing in the snow with ski clothing and equipment included in the ticket price. Young or old, there is something for everyone, from the beginner to the snow sport enthusiast. 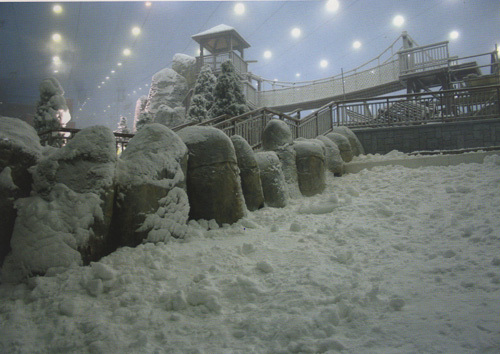 Ski Dubai is a unique mountain-themed attraction that offers you the opportunity to enjoy real snow in Dubai all year round. Ski Dubai is part of the Mall of the Emirates, the largest shopping and entertainment centre outside North America, offering over 450 stores and services. Features an exclusive retail shop, Snow Pro, which caters all your ski equipment needs. Covers an area of 22,500sq metrs, with real snow all year round. 5 different slopes offer a variety of runs for beginners to intermediates up to 400 meters long. Temperature is maintained at a comfortable 1°C to -2°C and accommodates 1,500 guests with professional assistance and instructions.